Home Costs > How Much Does the Gutter Helmet Cost? How Much Does the Gutter Helmet Cost? If your gutters are full of wet leaves and sticks, they can often become quite heavy, which can often lead to unwanted damage such as leaks and/or paint damage along the side of the house. With this system, water is able to enter the gutters as it’s intended to and will be expelled through the spouts just like normal, but unlike traditional gutters, the foreign debris will be kept out with the shield-like system in place. How much does Gutter Helmet® cost per foot? The cost of the Gutter Helmet® system depends on the height of your home, the amount of corners you have, your roof and the total length necessary. On top of this, you also need to factor in your existing gutters condition and the fascia boards, which are the boards along the edge of your roof that supports the gutter. If your existing gutters were in poor condition and/or were installed wrong, this could increase the costs. The costs, according to our research online, is about $7 to $13 per foot installed. To find an exact quote for your scenario, highly consider using the free contractor estimator tool at HomeAdvisor.com. On PissedConsumer.com, previous customers chimed in with their thoughts, claiming they had paid anywhere from $2,000 to $4,000 to have their Gutter Helmet® system installed. All Gutter Helmet® installations, according to the official website, include a tune-up of your existing gutters, including the cleaning, sealing, re-pitching and adding hangers as needed as long as the existing gutters are in good condition. You’re able to choose from a variety of colors, including black, bronze, brown, charcoal, green, pale gray and timber. The features include a textured surface for an increased strength, nose forward design to keep debris out, brackets to resist corrosion and a finish to guard against moisture and fading. Gutter Helmet® is made of a durable, lightweight aluminum that’s reinforced with stiffening ribs. The system also includes reinforced aluminum alloy brackets to hold the gutter covers in place. The system is said to last a lifetime and is backed by a Triple Lifetime Warranty that’s even transferable to the next owner of your home. If your gutters are in poor condition, then it won’t make sense to install new gutter covers. If your gutters need to be replaced, then it’s best to budget $4 to $25 per foot, depending on the material you choose. In some circumstances, the costs can rise if your home were to have hard-to-reach places, causing the contractor to use special equipment to access certain points. As a premium add on, heat de-icing cables can be added to prevent snow and/or ice damage. Do your research before handing over thousands of dollars. These reviews can be found online via the website mentioned above (PissedConsumer.com), RipOffReport as well as via a simple Google search. 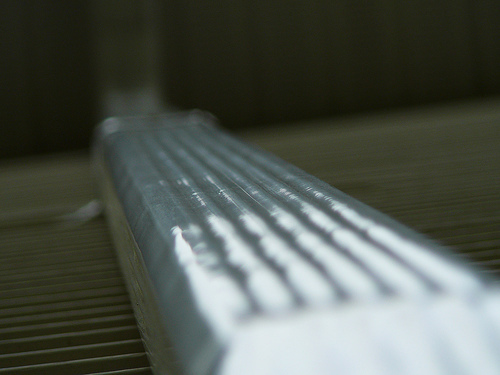 The slit is only 3/8 inches wide, ensuring only water gets through. According to the official website’s FAQ page, it can handle up to 22 inches per hour. Gutter Helmet® is just a branded “gutter guard.” Be sure to compare at least three to five other options to see what works best for your situation. Popular options include Leaf Guard, Leaf Solution, One Guard and Rhino Gutter.